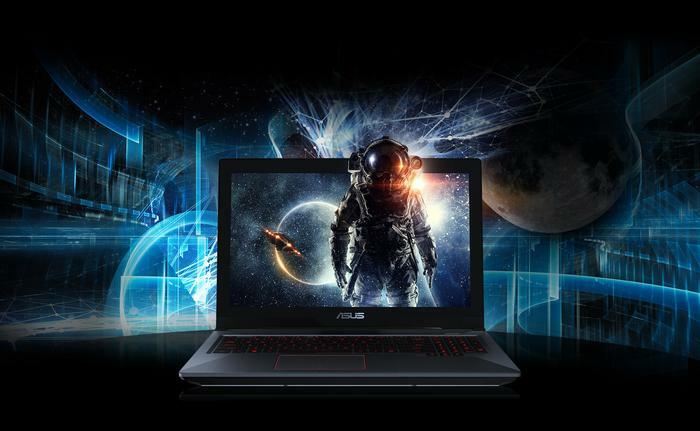 The newly-released ASUS FX503 gaming laptop might not carry the Republic of Gamers branding that ASUS usually stick on their gaming products. They’re not the first vendor to try and nurture a new branch of their gaming business. Dell have been bolstering their Alienware lineup with Inspiron gaming notebooks for a while now. Still, it does pose questions and put ASUS in a weird position where it feels like it is almost in-competition with itself. However, with an Intel Core i7 processor, Nvidia GTX 10-Series graphics card and 120Hz display to its name, the FX503 comes well-equipped to answer. Simply put, the credentials hardware here are far from in doubt. This thing is a lean, mean, neon-lit, glowy-metal-sci-fi-death-machine. 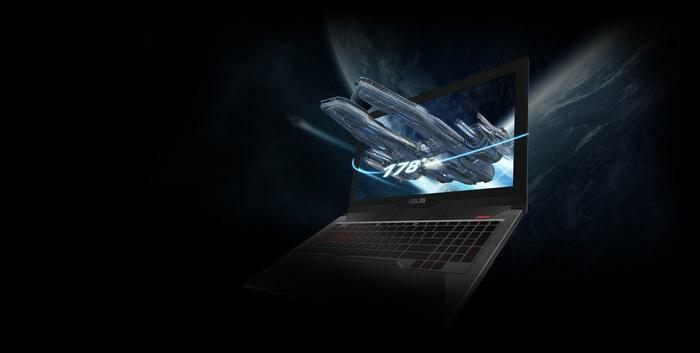 As mentioned above, the ASUS FX503 might not fall under ASUS’ broader ROG gaming sub-brand. However, curiously, there’s not a huge difference here in terms of aesthetics. As we said before, this is (yet another) neon-lit glowy-metal-sci-fi-death-machine in most respects. At a glance, the biggest between this and something like the ROG Strix is the price. The FX503 is a little cheaper. That said, it’s hardly a cheap-feeling piece of hardware. Though ASUS have opted for plastic over metal here, the FX503 does boast some nice texturing on both the interior and exterior of the notebook. In practice, this feels certainly comparable to what they do with their flagship Zenbook products - though the build quality lacks the same premium touch. It feels like a fair bit of work has also gone into the FX503’s keyboard. It boast low-profile scissor-switch keys with an actuation distance of 1.8mm, N-key rollover and - of course - stylish red backlighting. As a result, the keyboard on the FX503 is a delight to use. Gaming experiences felt tactile and while a dedicated mechanical keyboard can never be truly replaced, the FX503 is well suited to offering up a more-than-serviceable substitute in the meantime. Then there’s the main event: the 120Hz display. While the FX503 isn’t quite the first laptop to offer such a display, 120Hz is still a relative rarity in the gaming notebook space - and a much-appreciated inclusion here. That said, the fact that the display is only Full HD does let the rest of the device down a little. Putting the refresh rate aside, it makes the FX503 feel frustratingly ordinary at times. Competing gaming laptops have been jumping on the 4K and HDR bandwagon over the last twelve months and its absence here is felt. 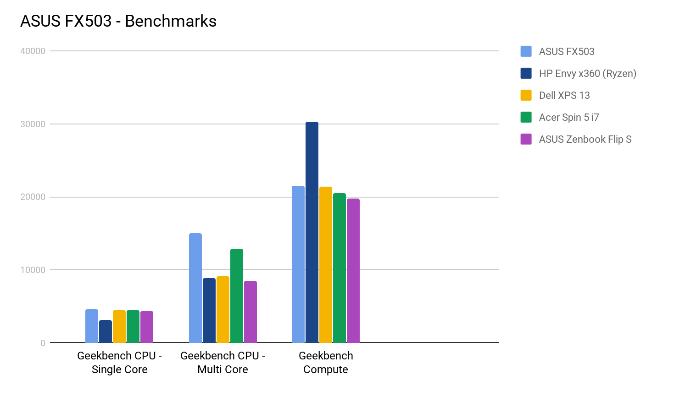 In terms of the performance, the FX503 delivers results that do swift justice to the seventh-gen Intel hardware beating at the heart of the laptop. In everyday performance, it excels. It’s responsive, fast and even keeps pace with some of the 8th-gen Intel processor-running notebooks out there. When it came to gaming, the ASUS FX503 delivered on a lot of the heavy lifting that the company say its capable of. However, the fact that it’s only packing a GTX 1050 does see it lag behind more heavy-duty rigs like the MSI GE73VR. In the Total War: Warhammer 2 benchmarking test, it managed an average of 39.2FPS - which is mostly-playable but far from seamless. When subjected to the Battery Eater testing tool, the ASUS FX503 took just 1 hour and 4 minutes to dissipate its entire charge. As is the case with many gaming laptops, you could burn through a fully charge in just over the time it takes to watch the average episode of Game of Thrones. 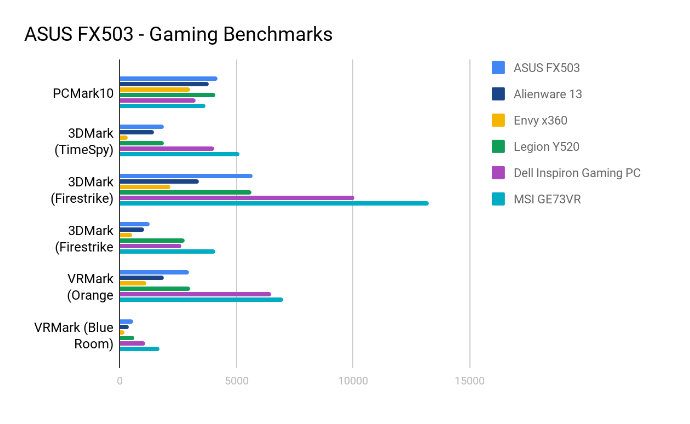 Frankly, this isn’t a great result - but it’s not far outside the average for gaming laptops, which usually suffer in this area.